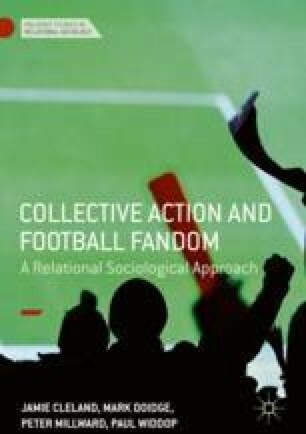 This chapter lays down seven analytical touchstones to understand the collective actions of football fans that can be gathered from the published literature in both the sociology of social movements and the sociology of sport. These analytical touchstones are (i) the structures of and roles in collective action; (ii) affect, emotion, and collective effervescence; (iii) communication, cooperation, and conventions; (iv) mobilizing resources; (v) tactics; (vi) recruitment to collective action and ‘outcomes’ of mobilization; and (vii) the spaces and places of organization and action. Each is relationally defined and discussed. González-Bailón, S., & Wang, N. (2013). The Bridges and Brokers of Global Campaigns in the Context of Social Media. SSRN Working Paper. Available http://ssrn.com/abstract=2268165. Accessed 8 July 2017. Spirit of Shankly. (2010, October 15). Spirit of Shankly Statement on LFC Takeover. Available http://www.spiritofshankly.com/news/2010-10-15-spirit-of-shankly-statement-on-lfc-takeover. Accessed 9 July 2017.